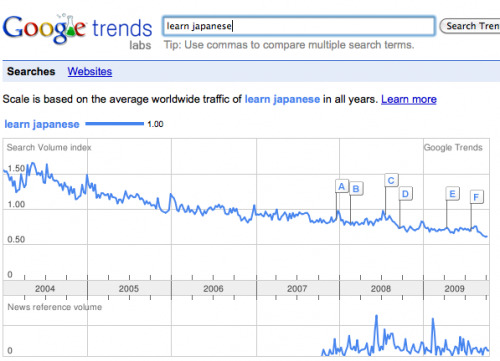 Is Learning Japanese Not Popular Anymore? And what does the future hold? Of course, one of Tofugu’s goals is to make Japanese learning cool again. “Again?” you ask. “But I’m so cool.” Sorry friend, but the All-Mighty Google doesn’t lie. It looks like learning Japanese is trending down, despite the popularity of anime, manga, and the like (though, actually, if you look it up those keywords are also trending down as well… Cause/correlation? Hard to tell). So how dorky and niche has Japanese learning gotten? Over at Google Trends, you can see what people are searching for. In this search, I looked at “Japanese Language” to see how that was doing. 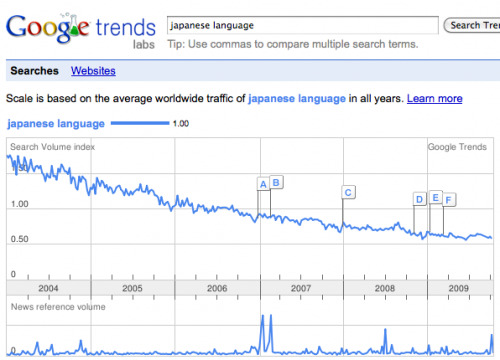 As you can see since the beginning of 2004, the search “Japanese Language” has really gone down. It looks like it hasn’t quite leveled out yet, so I imagine we’ll continue to see a bit of downward trends. I wonder how language learning companies have been doing. Perhaps they are in trouble right now? The term “Learn Japanese” has also gone down – it’s not as sharp as “Japanese Language,” but it still reflects the downward trend. Uh oh, Japanese. 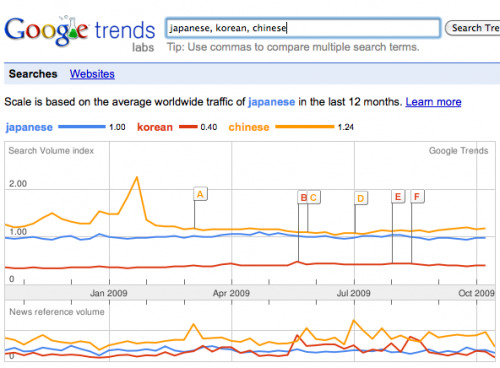 So, how is Japanese doing against other Asian languages? Over the last twelve months things have been fairly level. I was surprised to see that Chinese isn’t that far ahead of Japanese, especially considering the popularity of the Chinese language recently.